Due to popular demand here’s my big list of how to save thousands each year by shopping in the right places both online and offline. These are the places I shop and the tactics I use to save time and money every week. I use my calendar and phone alerts to make sure I stay organised. This is roughly my weekly run. Depending on my weekly schedule I will either shop in store (with my daughter) so we can get out of the house or online if time is limited. Set up a weekly delivery and set and forget. I find Sat morning delivery is best. Just when you run out – there’s that fresh milk waiting at your door. Note: Buy two long life milks at Aldi to keep in the cupboard in case the kids drink all your milk in one day. http://coles.com.au Shop online and sort by price / specials. http://woolworths.com.au Shop online and sort by price / specials. http://therejectshop.com.au For kids lunchbox and party snacks. Put a note in your weekly calendar to schedule delivery for Sat morning. Click and collect is also convenient but I prefer someone to carry those groceries to my kitchen bench. Shop online and click and collect for FREE. Pick delivery for $7. Order on a Tues in time for the weekend. Brand ‘Gossips’ or their six pack wine boxes are a great deal. Shop in store for the month. Shop with a list. Be strategic. Pre-plan your dinners with a grocery list. Online: http://www.bulkwholesale.com.au/ – Buy online and in bulk for the season. Put a note in your calendar for the beginning of each season. In Store: http://therejectshop.com.au – The Reject Shop for laundry items & toiletries. 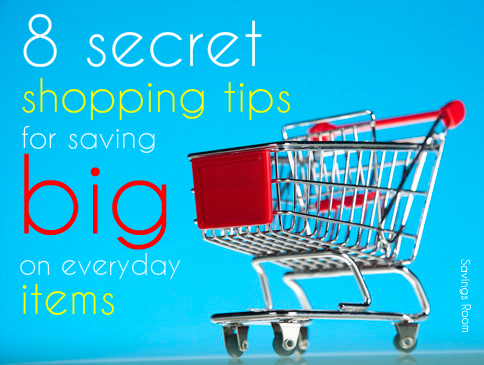 Do you have any secret tips for saving big on everyday items? Share them in the comments below.